decided sequence (below left). It doesn't produce a tune but rather a constantly changing pattern of sound. 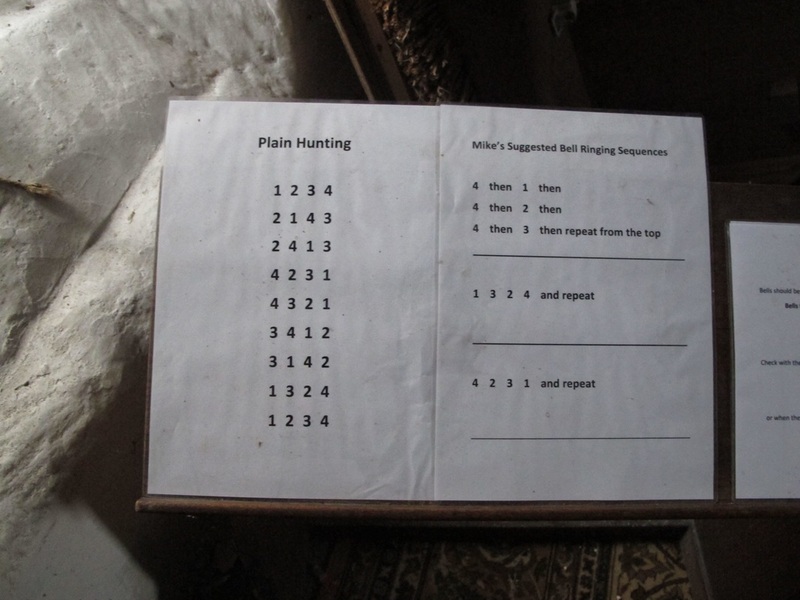 The art of change ringing in English churches started with honouring the death of Elizabeth I in 1603. It was immediately accepted as part of our ceremonial tradition and weekly life. It stood us apart from almost every other country in the world, just a small social cultural detail that became greatly significant. 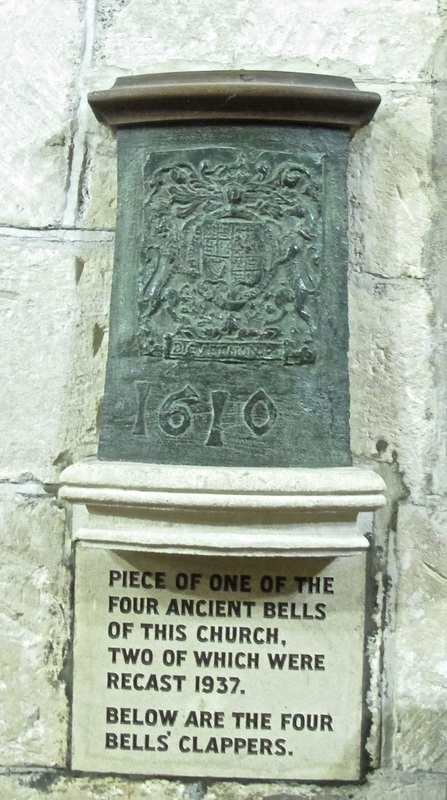 Many countries now ring the changes but it is still most popular in England where there can be up to 16 bells. 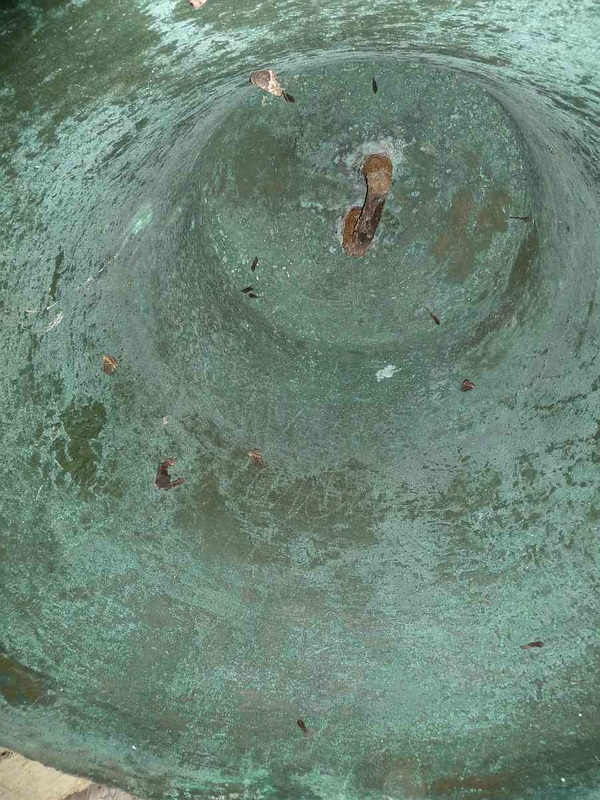 This article tells of the four bells at St Thomas à Becket Church from the perspective of a bell-ringer. 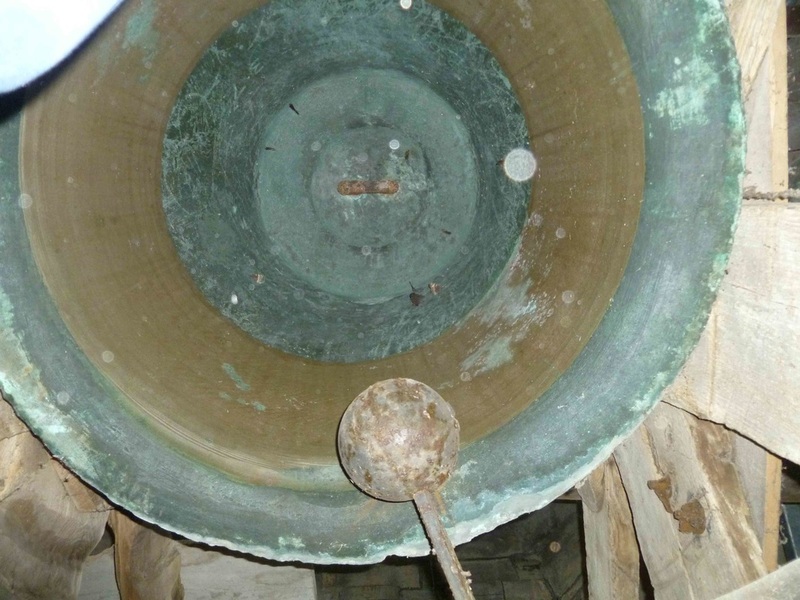 Three of the four Box bells were removed for restoration in 1936. Seen in the photo left are the three bells: Left to Right: Bells 1, 3 and 4 shown in the street outside the church in Church Lane. Guided Tour & Brief History. Right: Looking up at the inside of the spire. My first impression was amazement at seeing three of the bells, still fixed to their headstocks (block holding the bell's weight), suspended like pendulums by long steel bars with enormous hinges near the top from a huge girder (heading picture). They do actually swing a little bit but I didn’t push them too far ! I cannot imagine why they were hung like that. Janet Anderson-MacKenzie, the vicar, explained that the bells were hung for chiming this way to take the weight of the bells off the rickety and ancient frame and to take the strain of full-circle ringing off the tower stonework, although the walls looked fine to my inexperienced eyes. (The tower already has buttresses on three corners to take the weight of the bell chamber and spire which were added in the fifteenth century). But then more recently concerns were raised that the girder itself was causing a problem as it had been firmly keyed into the walls, causing problems of differential expansion I expect, and above the windows at that! So now some more delicate galvanised steel trusses have been put in on proper mountings to take the weight of the girder and the bells; the big girder now has gaps all round between it and the walls (heading picture again). The new steelwork was installed in 2012. It was designed such that each component part weighs less than 25kg and is of restricted length such that it could all be carried up the spiral staircase by two men and assembled in situ. After getting over my initial surprise I picked my way carefully over the insubstantial frame, which I believe is elm, and which appears to have been changed many times over a couple of hundred years or more (above left), to take some pictures. 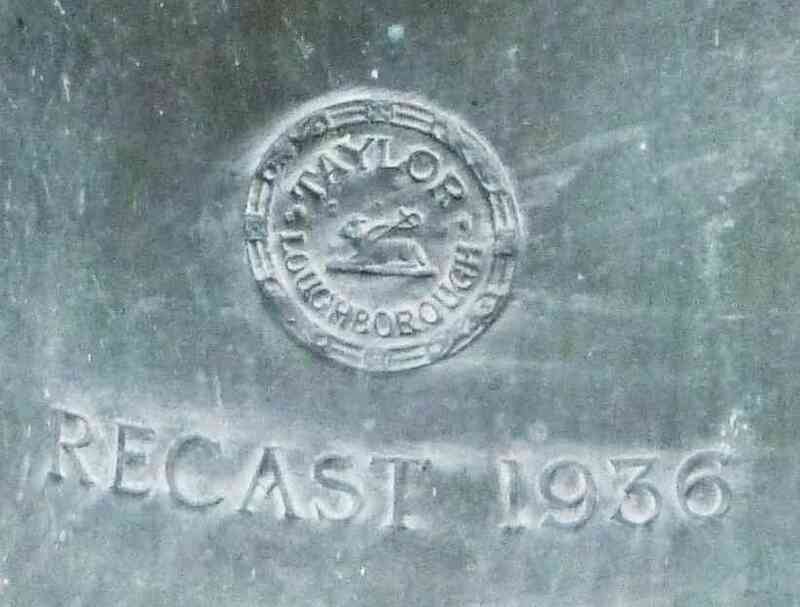 When Taylors recast the 1st and 4th in 1936 they used the originals as patterns; certainly the 4th carries the same decoration and inscription as the original and even the date, 1610, although round the other side it says Recast 1936 (above right). The 1st’s inscription was not so clearly visible but was originally dated 1617 and was cast originally by one of the Perdues, same as the 4th. The modern 1st is simply bolted to a frame cross-member (below left), unlike the weird arrangement of the other three bells. 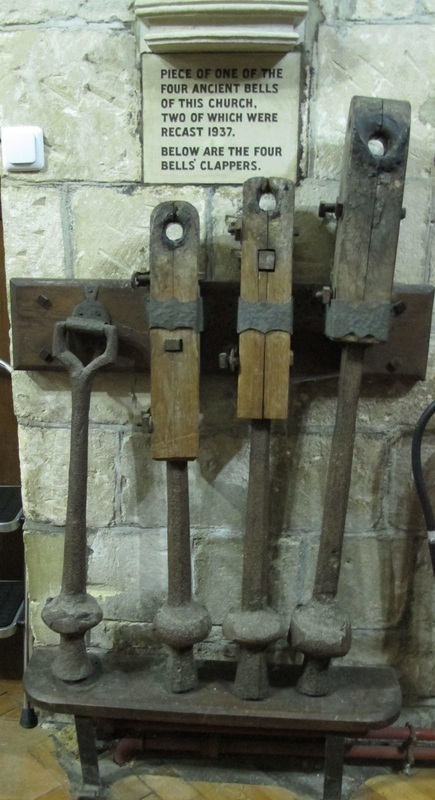 The 2nd and 3rd are very old, estimated at 1540 and 1480 respectively, retain their canons (metal handles) in vintage wooden headstocks (below left and right) and still have their cast-in staples (hinge holding the clapper). It appears the 2nd was not taken out of the tower in 1936 and seems to be as cast. The edge of the 2nd is a bit chipped which may show an attempt at raising the tone a bit but is more likely just damage. All the others have been tuned by machining the inside. Although there are no remains of stays or wheels, the horizontal latchet sliders are still to be seen in the pits next to bells 2, 3 & 4 (see below). 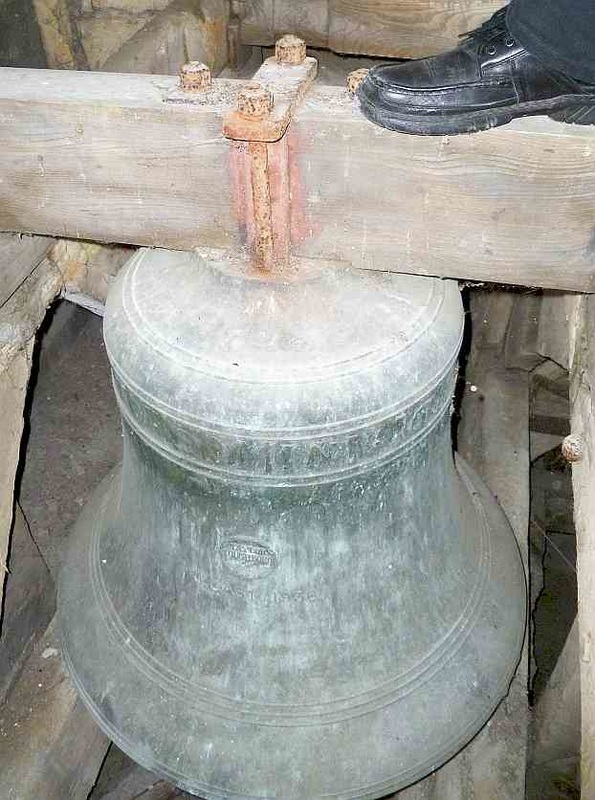 The bells now have normal cast-iron hammers operated by pulling ropes downstairs in the usual way. They are lovely heavy bells, are in tune with each other and approximately in the key of Eb. They are rung every Sunday and for weddings. The fascinating picture (above left) shows the hammer of the 3rd. The brown ring is where metal was machined off to increase the pitch slightly and you can also see the cast-in staple. 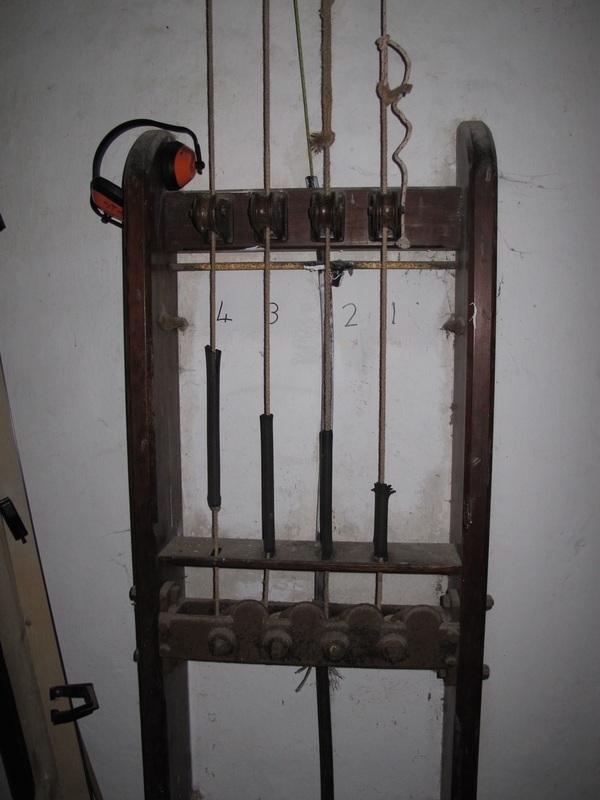 The picture (above right) shows the untuned 2nd with the staple from which the clapper would have hung, probably using a baldric (leather strap). Close examination of both reveals small dark objects. These are butterflies, shacked up for the winter! For safety reasons, access to the bell tower is kept locked. 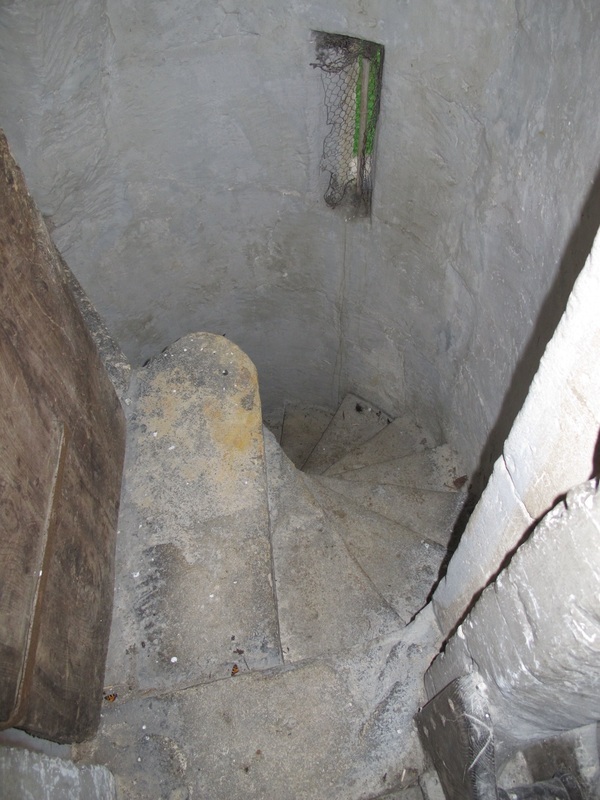 It ascends up a narrow stone spiral staircase (below left) and the changes are rung from a first floor room via the pulls (below right); photos courtesy Carol Payne. Most Box residents have heard the bells which are chimed regularly on Sundays and for weddings. The changes are rung by special agreement with the vicar. Parts of the historic bells and clappers can be seen inside the church to the left of the main entrance (photos courtesy Carol Payne). Martin Devon has been the person who assists with any problems in the bells at Box (and Ditteridge) and is uniquely placed to add to this story. He commented that another interesting detail is that it's just 300 years since the first mathematical "full peal" - ie all the possible changes on 8 bells in order - was completed at St Peter Mancroft, Norwich in 1715. 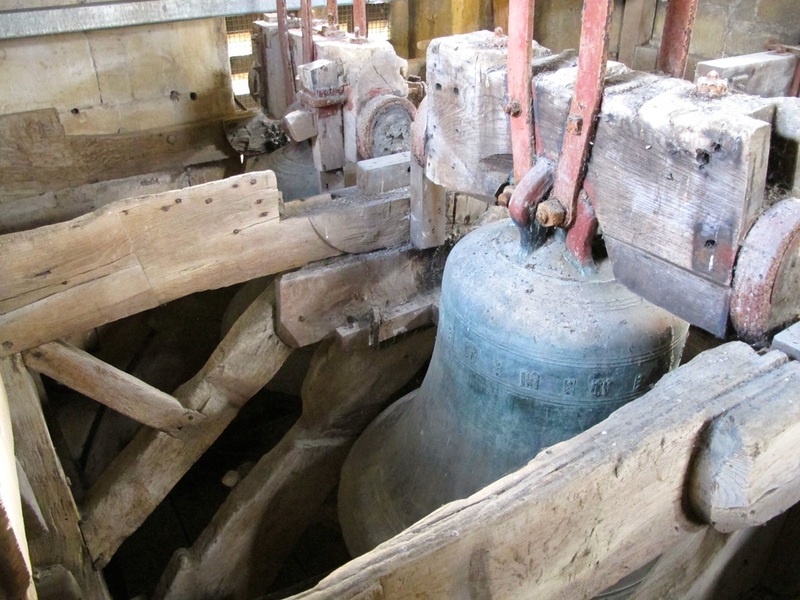 A peal (5,040 changes) usually takes around 3 hours so to complete this on 8 bells takes 40,320 changes up to 24 hours ! Poor Box can only manage 24 changes on its four bells which takes about 1 minute. Table courtesy George Dawson, A National Bell Register (NBR), http://georgedawson.homestead.com/nbr.html. 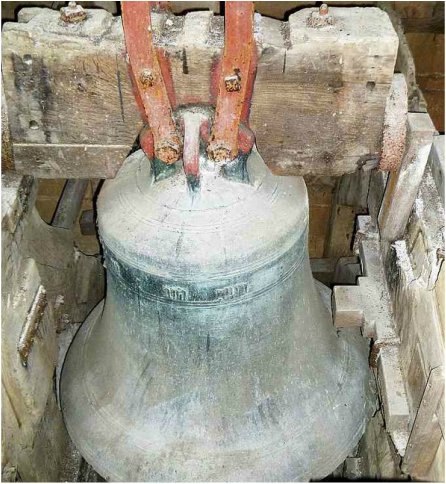 Taylors are one of only remaining bell foundries left in the country, Whitchapel being the other. Bellringers normally refer to Dove's Guide for Church Bell Ringers (http://dove.cccbr.org.uk/home.php) but as Box's bells are for chiming only they are not in that guide.